Pinnacle Arborist offers all the books and DVD’s you need to increase your training and knowledge in the tree industry. A must have is The Tree Climber’s Companion for climbing techniques, the best knots and tools of the trade. Literature is available to learn the industry standards with OSHA and ANSI including standards for Pruning, Fertilization, Lightning Protection, Electric Utility Rights-of-Way and more. The Certified Arborist Study Guide will help you pass the Certified Arborist test. Achieve successful tree felling with the book To Fell A Tree or have a conversation coffee table book with High Climbers and Timber Fallers. Jerry Beranek’s set of 6 DVD’s provides over six hours of filming that even the veteran arborist will enjoy. Many titles are available in Spanish. If we don’t have what you are looking for, please call us at 501-663-8733 and we will try and get it for you. (BMP) IVM Booklet, Techniques for vegetation management for rights-of-way managers, 36 pp. (BMP) Lightning Protection Systems, basic lightning physics, installation and maintenance of lightning protection systems, 40 pp. (BMP) Tree Fertilization, guidelines for tree and shrub fertilization, goals and objectives, 34 pp. 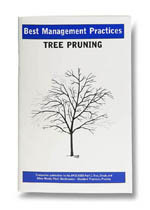 (BMP) Tree Pruning, proper pruning to meet industry standards and customer expectations, 35 pp. (BMP) Tree Pruning - Spanish, proper pruning to meet industry standards and customer expectations, 35 pp. (BMP) Tree Support Systems, guidelines for cabling, bracing and guying trees, 35 pp. (BMP) Utility Pruning of Trees, industry guidelines for pruning trees along powerline rights-of-way, 22 pp. ANSI A300 Construction Management and Tree Protection, industry guidelines and practices. ANSI A300 IVM Guidelies, industry standards for integrated vegetation management along rights-of-way. ANSI A300 Lightning Protection, industry standards for installation, inspection and maintenace of lightning systems.